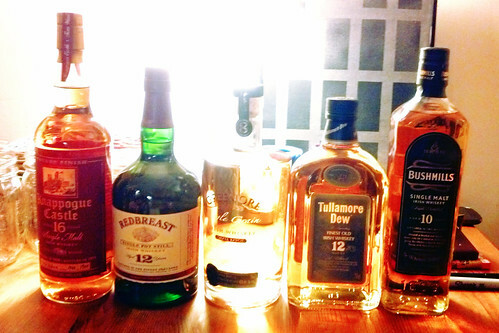 whiskey club: the irish whiskey edition. every four months or so, the whiskey club meets and samples a variety of whiskey’s purchased by someone in the club who knows a lot more about whiskey than i do. this time around we were sampling irish whiskey which, as the name so aptly indicates, is distilled and aged in the island of ireland. i dropped the ball and didn’t take any tasting notes. i’ll have to fix that oversight the next time around. all were quite drinkable, but there is quite a difference between each brand in terms of smoothness, and flavors etc. perhaps the biggest surprise was the fact that the 16 year old knappogue didn’t win first place, but it came in a close second to the redbreast. you’re not going to go wrong with any of them, but if you want a special treat, go with the redbreast 12 year old. Previous Poston the (non? )effectiveness of the flu vaccineNext Postrecipe: peanut butter power balls.